I tried to submit this via a support ticket but it doesn't allow me to enter my password. I am getting False Positives as well...Maybe @JP_ can advise here. Our Team is aware of the rule causing False Positives and is actively working now to resolve. Please stay tuned for updates. Getting tyhe same re. about 25 .exes that I know are clean, and in fact have been on my system for some weeks now...so something gone a bit funny in the Cloud...I reckon. Brought down one of my servers with Sage Businessworks installed. I was not able to restore from quarantine via web panel.. or either I didn't wait long enough. I ended up having to set the Endpoint as unmanaged and restore directly from the GUI on the server. How long should have the restore have taken and I hope this gets fixed VERY quickly before it flags anymore of my servers as malicious. What is everyone's recommendation about removing server files? Do you have it set to automatically resolve or just send the alert so that you can determine what to do with the file? Same here. I was up to 83 false positives in c:windowssystem32 before I just gave up and disabled Webroot. 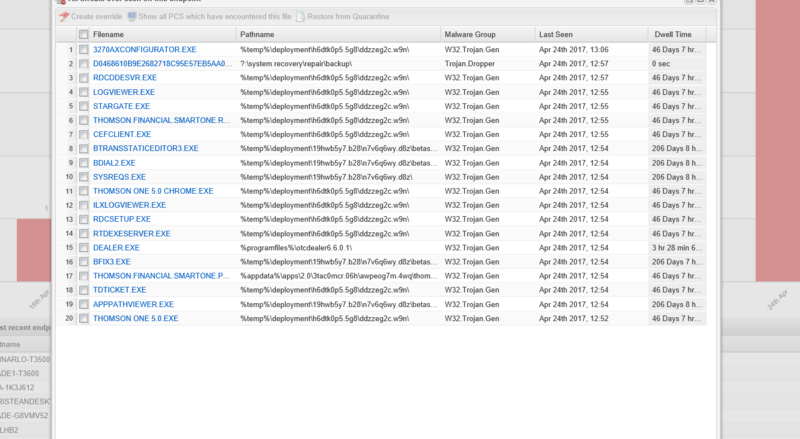 Everything I submitted to VirusTotal showed up with old hashes and 0 hits, but re-analysing the exact same file showed only 1 new hit, which was Webroot. I'm not sure what all it screwed up but one of the exes was needed to raise admin privileges. It finally had multiple scans going at once and just locked my PC for 20 minutes. That's when I just gave up, powered on, and disabled it. I have this deployed on hundreds of clients and servers at my company so I hope this doesn't wipe us out today. It appears some update today has screwed things up badly. Windows 10 64bit Faster insider ring. Or a multi-million dollar company trying to conduct business and not able to because it has flagged server applications as malicious and quarantined them. I would have much rathered it be Rocket League not opening. FYI This is taking out all of the MSPs. Specifically we are losing almost all .EXE files across all of our clients. It is also hitting our management tools so this has the potential to become a huge labor issue. Do you have any recommended policy settings that we can setup as a new policy to temporarily put a halt to them? We are in teh same boat here...tons of false positives today. I has set it not to resolve by deletion..but who knows how long that will take. So far removed everything from updaters to database management tools. This is pretty awful. Really hope the restore from quarantine works. Noticed in the logs webroot also deletes registry and any associated config files as well for delete applications. Hey everyone, we are aware of a rule change causing technical issues. Our team is working to restore functionality. We will provide updates as info becomes available. Thank you for your patience and sticking with us while we troubleshoot this issue. More to come as soon as we have it. This is brutal. It's detecting all kinds of files and causing our clients major grief. It's affect about eight of our managed clients. Thanks for the update, freydrew, much obliged. I am sure that the Support & Development Teams are working flat out and will have the issue sorted very shortly...as they usually do. Is there a way to get all the false positives that have deleted automatically? This is going to be a nightmare for us otherwise. I have turned off scheduled scan and real-time shield until a fix has been pushed out. It won't undo any damage already done but will hopefully help mitigate further false positives. Hopefully we can get notified when it is fixed. We'll uninstall Webroot until a fix is available since we've never seen any way to just disable it (without reactivating on reboot). Add Altium Designer (dxp.exe) to the list of false positives. WR deleted the .exe and now won't allow re-download or re-installation of the software. Not good. Trying to restore files from quarantine, I tried from the web console and refreshed config, no go yet. Also tried to restore from the machine itself but says it is managed by the web console. Do you have a recommended method to restore files deleted by this issue? I have locked my door and hiding from the users until I have an answer.